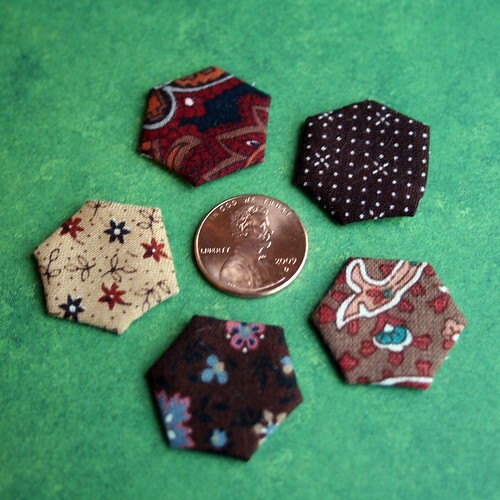 Nothing on my list of projects seems to interest people more than the miniature hexagons. Lots of questions have resulted from my posts about this strange, antiquated process. Between blog comments, scuttle over on flickr, and personal emails, there are a lot of good questions going around. Today I’ll answer some of those questions and hope to help those of you who may be considering this undertaking. Don’t forget, I posted a bunch of tutorials on a previous entry and they are a good place to start. whats the scale? real size of the cells? 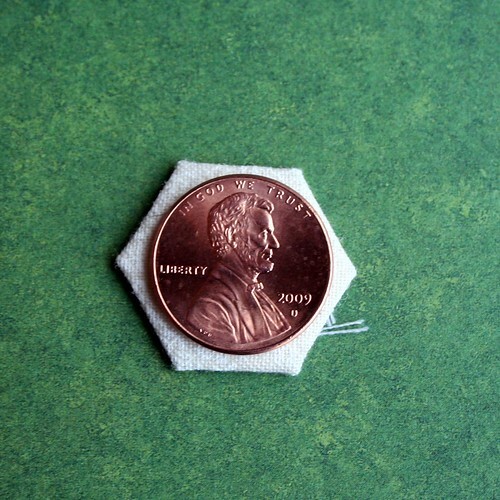 As you can see above, the hexes are just a hair larger in diameter than a US penny coin. I used this awesome graph-paper-generating website to create my paper hexes. Also, please note that I am not in a contest to create the smallest mini-hexagons known to man. I just picked a size that “felt right” to me and will look nice in its completed project (someday!). That said, if you want to see some other really mini hexagons, check out Christine’s work here and here (website plays music). Fiesta’s seem to be about the same size as mine. Mini-Mum is into it, too. (Click here to see the tiniest hexagons yet!) And who could forget duniris’s unbelievably amazing hexagon pincushion? I’m sorry. I think the mini-hexes thing is an illness. Unfortunately, it is contagious! Hey! I have just about all of those same prints. That’s *way* cool. Well, shoot! That is cool, and a little creepy, since most of these fabrics were gifted to me as scrap-bags and cast-offs from 3 different friends and family members. I’ve been combing through those bags for the smallest pieces. I’ve finally found the scrap size that I can throw away — anything too small to be a penny hex. The one thing I’m confused about: do you pull out the papers before you stitch the hexes together or after you’ve basted the hexes? What I mean is, do you need enough paper pieces for an entire project at once or can you just reuse the same 10 or so over and over again for the same project? 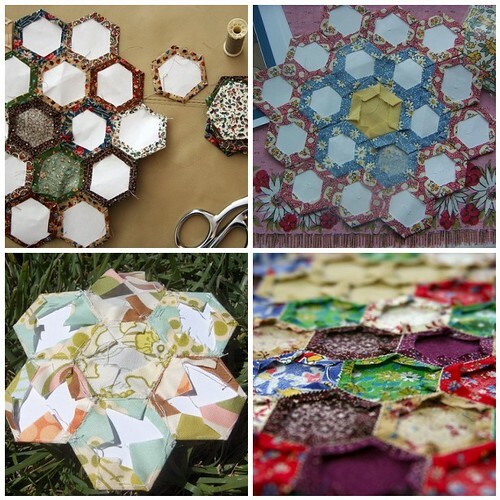 You can absolutely re-use the paper hexagons and many quilters do. I haven’t, yet, because I am still unclear about the layout of my hexies and you remove the papers once you start stitching them together. Hundreds of hexagons carefully cut from birthday cards, magazines, old drawing paper, the scripts of my ex-husband’s novel and my Mum’s book of prayers. . . The last fifteen years of my life are bound up in the making of that quilt, and the history of my family is in the fabric. I used regular copy paper for my hexes. It’s worked fine, but if I were to do it over again, I would use a heavier paper — even just a finer quality of copy paper. I think it’d keep the hexes more uniform and less likely to warp (as my upper-right hex did in the first photo above — need to go fix that one). Happy to answer any more questions, if you think of them! In the near future, I’ll post photos of my process, including step-by-step on my basting process, and images from other crafters at various stages of their projects.